BlackBerry has finally rejoined the mobile OS party, but can it compete? Our smartphones are becoming more and more powerful as we demand greater flexibility, better features and faster performance which means the software they are running has its work cut out. It's a highly competitive market and one the likes of Google, Apple and Samsung seem to be doing pretty well out of, but for others it's a hard slog as firms such as Nokia, LG and BlackBerry try to keep pace. With four operating systems sitting on a myriad devices it can be hard to work out which one is best for you, so we've compared all of them to make that choice a little easier. The interface is core to any mobile platform as this is what you'll be greeted with day in, day out and makes the most difference to how you use your smartphone. Apple's user interface (right) is famously known for its locked-down approach with iOS 6 giving you very little control over what can be changed and customised, with just basic functions such as changing the wallpaper and moving app icons available. There is an advantage to this walled garden approach though, as it makes iOS 6 an easy system to navigate as options are limited which benefits users who are less tech savvy, or new to smartphones. iOS hasn't changed a great deal since its inception back in 2007 and it is starting to feel its age, especially as we're seeing rivals making significant advancements on their platforms. At the other end of the scale to iOS is the open source Android platform, built by Google, allowing users far more freedom on their handsets. Instead of just an app list, Android (left) gives you homescreens which you can place apps, widgets and shortcuts to provide a handset which is more tailored to your needs instead of the one-size fits all approach of its Cupertino-based rival. While technology lovers generally love the openness provided by Android, the experience can be a difficult one for anyone who isn't so technically minded with seemingly endless options and settings littering every app. That said, the latest incarnation of Android, known as Jelly Bean, is definitely the best iteration from Google and goes some way to overcoming the complexities found on previous versions. 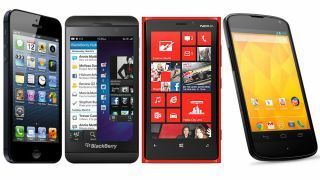 Windows Phone 8 and BlackBerry 10 fall in between the two leaders of the smartphone OS war in terms of openness, and are caught in a battle for the spot of 'third most popular mobile OS'. At the moment Windows Phone 8 (right) has the upper hand simply because it's been on the market for several months with BlackBerry 10 only just launched. Microsoft has chosen to go down the more insular Apple route with Windows Phone 8, offering an almost identical user interface on every device, with a very different layout to anything else on the market. The homescreen itself consists of a mash up between apps and widgets in the form of Live Tiles, which update automatically to show you the latest information be it a new email or the latest scores. With large, clear Live Tiles and an unfussy, uncomplicated app list and menu system Windows Phone 8 is great for first time users as it makes for an easy ride into the smartphone world, albeit a little limited in places. BlackBerry 10 (left) goes back towards the general style of iOS 6 and Jelly Bean, but with its own twist. Instead of various navigational tools below the display or at the top of the screen BB 10 opts for a gesture-based interface, encouraging users to slide their way around the system. It's a radically different way of doing things and feels very alien to anyone who has previously used any other OS in the past, requiring the user to dedicate a decent amount of time to learn its ways. BlackBerry talks about how BB10 "just flows", but unless they're prepared to put the hours in and trust a brand new platform users may get confused just looking for simple things like the settings option in an app.